II Corinthians 9:8-11 – And God will generously provide all you need. Then you will always have everything you need and plenty left over to share with others. 9 As the Scriptures say, “They share freely and give generously to the poor. Their good deeds will be remembered forever.” 10 For God is the one who provides seed for the farmer and then bread to eat. In the same way, he will provide and increase your resources and then produce a great harvest of generosity in you. 11 Yes, you will be enriched in every way so that you can always be generous. And when we take your gifts to those who need them, they will thank God. 1. I will receive a generous provision of everything I need. Verse 8a – And God will generously provide all you need. 2. I will be made sufficient to carry out all He has purposed for me to do. Verse 8b/c – Then you will always have everything you need and plenty left over to share with others. 3. I will lay up treasures in heaven and experience the blessing of increased righteousness with God. Verse 10 – For God is the one who provides seed for the farmer and then bread to eat. In the same way, he will provide and increase your resources and then produce a great harvest of generosity in you. 4. 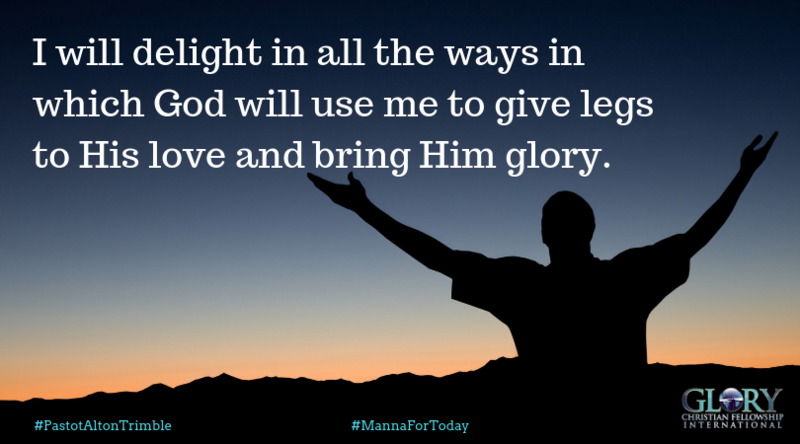 I will delight in all the ways in which God will use me to give legs to His love and bring Him glory. Verse 11 – Yes, you will be enriched in every way so that you can always be generous. And when we take your gifts to those who need them, they will thank God. Meditate on these things today and look for them in your life daily! Amen. Thank you for outlining the ways in which God provides for us. Lord, help me to delight in your ways everyday, in the name of Jesus. Thank You Lord for another wonderful Manna. Let me meditate on Your word always and be ready to give an answer to those that inquire or don’t know. In Jesus mighty and matchless name, Amen!